Read more: Guided Jet Ski excursions from Benidorm. Benidorm Hotels from 5 Star to All inclusive and Adults only - Something for everyone! Benidorm has something to offer for everyone, whatever type of holiday you are looking for; family, sporting, adventure, LGTB, relaxing or a singles holiday. Its spectacular beaches and clear water have earned it many Blue Flags as well as the leisure activities on offer in the resort. There are two water parks, Aqualandia and Aqua Natura, two animal parks Mundomar and Terra Natura as well as Terra Mitica. The Benidorm Palace provides the glamour with spectacular shows which are changed every year so repeat clients can see a different show each year. Tourism demands are constantly changing and Benidorm updates itself and changes with the trends to enable it to supply the holiday of your choice. Benidorm as a resort is not new, people have been visiting Benidorm since the 1800s when it was a spa & health resort. The very first hotel, the Hotel Bilbaino was built in 1929 on the Levante Beach and full board at that time cost just 8 pesetas. The first Tour Operators arrived in the 1950's and brought passengers from Valencia airport to Benidorm as Alicante airport did not open until 1967. The Hotel Colon first opened its doors in the 1961 and has now celebrated 52 years is testiment to how tourism then was vastly different to today. At that time there was approximately 15 hotels in Benidorm, kitchen staff used coal or firewood to cook meals and all linen was hand washed! Today the resort has approximately 40,000 hotel rooms, 20,000 apartment beds and 11 camp sites throughout the city. There are three 5 star hotels, thirty two 4 star hotels, seventy four 3 star hotels, fifty three 2 star hotels and twelve 1 star hotels. The last hotel to be built was the 5 star Barcelo Asia Gardens with a Thai spa and beautiful Asian pools and tropical gardens. The latest trends for All inclusive and Adult Only hotels are represented. The Adult Only hotels offer couples and families the chance to relax and unwind with all guests being over the age of 15/16. The Hotel Levante Beach Club & Spa, Sandos Monaco Beach Club & Spa and the Hotel CostaBlanca (which is located in a prime position right on the Levante Beach) are all Adult Only hotels. Some hotels such as the Hotel Teremar, Hotel Diplomatic and the Hotel Tanit admit pets, so you can bring the family pet along for the holiday too. Benidorm is also a popular Gay tourist destination and there is over 32 different bars, restuarants, clubs, cafeteria in the old town as well as a small hotel. So whether you are bringing your racing bike over to train in our fabulous climate or looking to burn the night oil in the discotheques you will find something to suit your tastes. 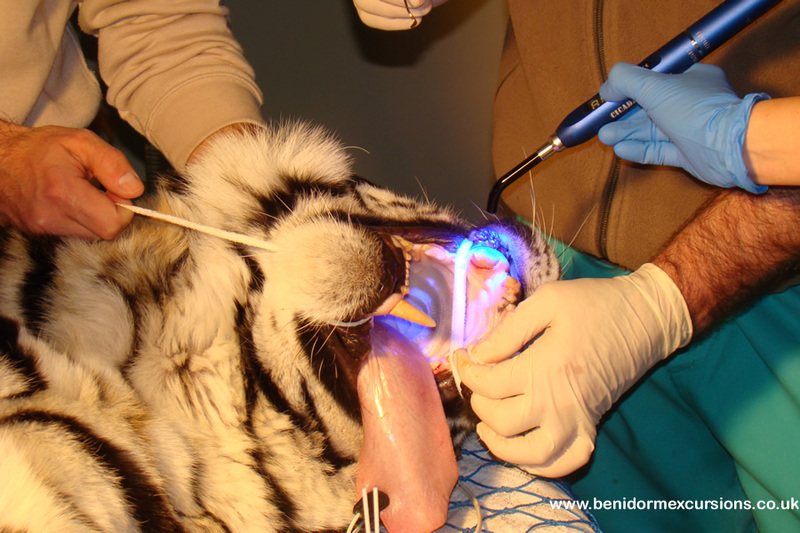 Read our article regrading the Benidorm Hotels & Apartments awarded TripAdvisors "Travellers Choice Award"
Mandi one of the Asian Tigers that resides in the Benidorm Theme Park, Terra Natura has just been to the dentist! The six year old tigress had not been eating which alerted staff at the Benidorm park. They monitored her closely and decided to intervene when the situation did not improve. She was sedated and when examined it was found that she had broken a fang. Seven people took part in the orthodontic procedure, including two vets, two Terra Natura park keepers and three dental surgeons. The 125 kilo tigress was given an anaesthetic and then administered gas to keep her sedated during the procedure. The surgeons removed the nerve from the tooth and Mandi has been given antibiotics and painkillers. All her food will be cut into small pieces over the next few days and any bones removed. A tiger’s fang can measure approximately 6 centimetres compared to the 2 centimetres of our eye teeth. The Asian tiger is considered to be the largest cat species. In the wild this tiger would probably have died, not being able to hunt and feed, as the pain from a broken fang coming into contact with its prey or the meat would be extremely painful. 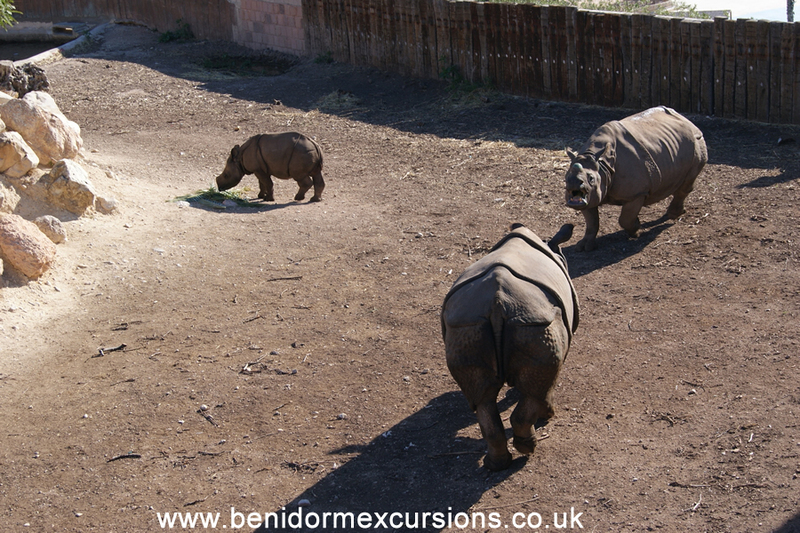 Experts at Terra Natura, the animal and nature park in Benidorm introduce young Susto to another female rhino. Susto caused quite a stir when he was born in Terra Natura in Benidorm in February 2012, as he is the only Indian Rhinoceros (Rhinoceros unicornis) to be born in captivity in Spain. Before he was conceived his mother Shiwa shared her enclosure with another adult female called Nisha. Both females came to the Benidorm park in 2004 and were only apart when taken to mate and then during Shiwa’s pregnancy. Since Susto’s birth, mother and calf have lived alone to avoid any possible attacks from Nisha but the time has now come for the two adults to be reunited and Susto introduced to other adult rhinos. Susto needs to adapt to other members of the species to be able to develop both physically and psychologically. Mother and calf appeared calm when reunited with Nisha, but Nisha had other ideas and there was a moment of tension when she threatened the mother and calf. Shiwa protected her offspring admirable and now staff from Terra Natura will pay close attention to their behavioural patterns over the next few days and will separate them again if the aggressive behaviour continues and then reintroduce them again until they become familiar with each other again. Watch the video of Susto’s birth. Baby Indian Rhino born in Terra Natura Benidorm. Benidorm island is just two and a half nautical miles from the most cosmopolitan Spanish tourist resort Benidorm. It is centred in front of the Canfali, a headland which separates almost equally the two enormous fine sand beaches, the Levante Beach and Poniente Beach . The surface of the island is just six and a half hectares, 350 metres long, 260 wide and reaching a height of 73 metres. There are boat trips to the island departing from Benidorm Port and also from the Rincon de Loix in high season, boats depart hourly. The island is triangular in shape, can be clearly seen from any vantage point and has converted the surrounding landscape of the coast, to picture perfect. Benidorm Island has a legend which tells the story of Roldan, son of Princess Bertha, Charlemagne's sister, who fell in love with a beautiful young girl. The girl had a mysterious illness that had condemned her to death. She could only be saved if the last rays of the sun could pass the enormous Puig Campana Mountain. Roldan did not hesitate and armed with his sword “Durandarte” he attacked the giant mountain. The piece of rock fell into the sea forming the island. The legend , like all legends is beautiful, but geologists affirm that the island, along with the smaller island La Llosa is a continuation of the neighbouring Sierra Helada mountain that continues down under the sea and surfaces again forming the two islands. The smaller island of La Llosa is almost completely submerged, at its highest point it is only 6 metres above the surface and its base is 30 metres deep. Both islands are important marine reserves, protected because of the high ecological value to the area. The plant life and birds that nest on the island are protected, for example the Audouin gull and the Cormorant amongst others, some of them making their nest in the cracks and caves of the cliffs. Benidorm island is a paradise for divers as moray eels, octopus and sargo take refuge around its rocky base. There is a path that enables you to walk to the top of the island and a restaurant opens daily, offering one of the best paellas in the area. Benidorm island is not inhabited but at the beginning of the 19th Century a few hundred people fled to the island to escape a cholera epidemic in the area. The island is also known as the Journalists' Island. In the Town Hall archives there is a document dated 26th of May 1970 , signed by the then Mayor of Benidorm, Jaime Barcelo and the President of the "Associated Spanish Press Federation", Lucio del Alamo. In this document the Federation is appointed Patron of the island along with all Spanish journalists. To purchase tickets for the boat trip to the Island or one of the other boat trips to Calpe or Tabarca Island, click here. Watch our video of the boat trip to Benidorm Island. Up close and personal with the animals on Terra Natura’s ZooTour.